Best Online Book Reading app for Kids. Welcome to GetLitt! best online book reading app for kids. Let your child discover a magical world of imagination, knowledge and inspiration. At GetLitt! we make reading fun. What better gift to give your child than a book? 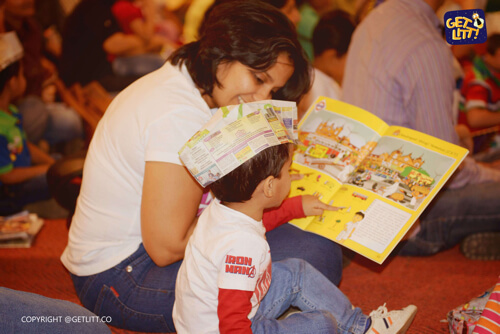 Kids love to explore the world and discover new things, and books are like magic portals into the world of imagination. Children’s books cover a wide variety ranging from books with pictures, comic books, fairy tales to tales of adventure and funny school stories. Good books make learning fun, and help kids sharpen their reading and comprehension skills. “But how do I motivate my child to read?” “Where do I find good books?” “How can I get them to read when they are looking at the mobile gadgets all the time?” If you are worried about these questions, relax. With GetLitt!, we have got it all covered. GetLitt! is the best book reading app for kids. It is also a library for kids of seven to twelve years of age. From bed time stories to comic books to fables and inspirational tales- we have got it all in one place so that your child can have all the books that they want. Our “litt” library is home to a treasury of books written by celebrated children's authors. We have e-books of all genres and categories that you can access anytime. "Books are a uniquely portable magic. "- Stephen King. Reading is an essential skill. Children who read regularly can easily comprehend letter sounds, and an increased exposure to sight words helps them develop their language skills. Multiple studies show that children who start reading early have better brain development, robust vocabulary, and more empathy and perform better at school. For parents, reading is a great way to spend quality time with their children. But most parents today face this dilemma: how do I get my kids to read when they would rather play games on phones and tablets? 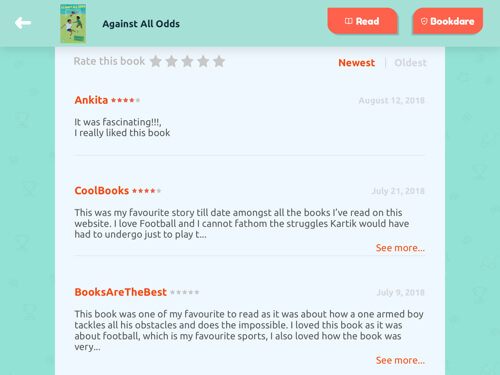 Why do you need Online Book Reading App - GetLitt! The problem is that it is difficult to find good books online, and good children’s literature is even harder to find. On the internet, there are some places where you can find scanned copies of old books in pdf or ePub format, or some audiobooks. However, many of them are of poor quality and may be difficult to find. Moreover, children are more attracted to books that are richly colored and contain pictures. High quality pictures add to their reading experience and make it more interesting. So, it will be great to have access to a digital library that boasts of a rich and varied collection, and where the books are of high quality. GetLitt! app combines the joy of reading with technology. The books you get on GetLitt! are of high quality, and the collection is robust. GetLitt! 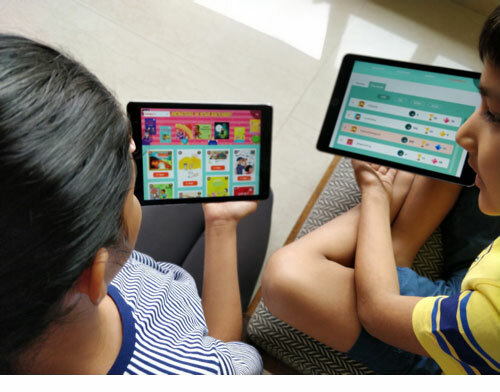 allows kids to read their favorite stories on digital devices while enjoying the fun game experience of GetLitt! GetLitt! goes beyond being a free book reading app. After reading books, children can also write reviews of the books they read - which is a great way to develop their language and comprehension skills. 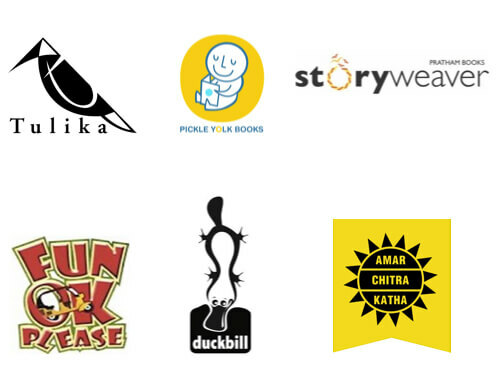 Our collection boasts of books from renowned children’s publishers like Amar Chitra Katha, Tinkle, Duckbill, Tulika, Storyweaver, FunOkPlease, PickleYolk Books and Ms. Moochie. What more GetLitt! Also works like an offline book reading app for your kids. The books on GetLitt! are on a wide range of topics that help kids not just improve vocabulary, reading ability and speed but also to expand their view of the world. 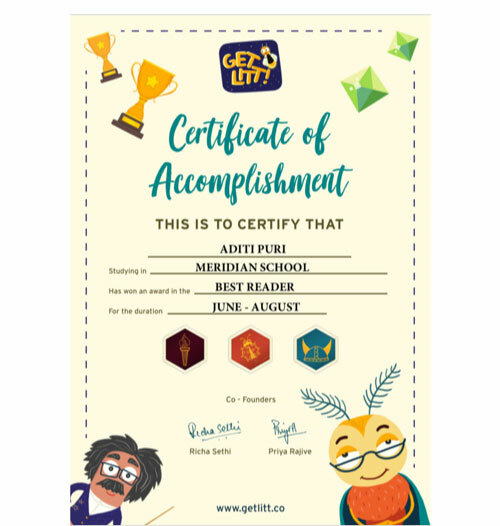 What’s more, on GetLitt!, kids can achieve badges, trophies and showcase their reading achievements. "From your parents you learn love and laughter and how to put one foot before the other. But when books are opened you discover you have wings." --- Helen Hayes. Imagine carrying an entire library of delights in your pocket. Anytime you need it, or anytime that your child wants to read, you can give him access to all the topics he wants to know more about and explore. You can easily do that with GetLitt! GetLitt! brings you a great collection of books. You can download it from Google Play and iTunes on your tablets. GetLitt! can also be accessed on desktops by logging in on the website. . Subscribe and get access to hundreds of books from great children’s authors. You can choose from various subscription models as per your need. GetLitt! 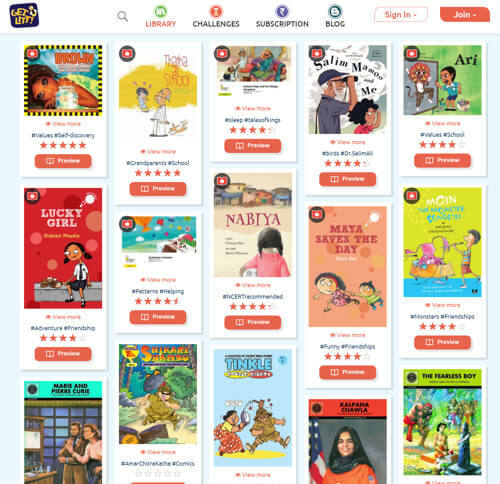 has a variety of e-books of different genres - adventure, humour, STEM, fantasy, environment, fairy tales, mystery and non-fiction from renowned children's publishers. You can easily navigate the library by sorting through different genres and categories. With more reading, your child can increase their reading levels. You can check on your child’s progress any time by clicking on the “My Story” tab, where you can see your child's current level, title and reading progress. The world of Book Reading App - GetLitt! “A book is like a garden- carried in a pocket.”----- Ancient Chinese Proverb. Our book reading app GetLitt! is a kids’ wonderland, where every kid is a hero. In Litt-o-sphere, your kid enters as a bug, who must find a way to defeat the evil Makadi Monsters. The evil monsters have shrouded the world in darkness, and they don’t want children to read and gain knowledge. They have hidden away the Knowledge Manis, and it is up to our heroes and their friends to find them. The wise guardian, Maha Moth, has a mission for them. The brave children must fight the darkness by releasing Jugnu who shed light on the hidden Manis. With the help of book-keeper Wazir Worm, the kids can select their books and with each page that they read, they release Jugnu that help break the webs of darkness. The more books they read, the more Jugnu they release. And the more Jugnu they release, the more books the kids unlock for reading- so that other kids can enjoy reading them too. For every three subscriptions, GetLitt! unlocks a fourth for a child who does not have any access to books. “Books shouldn't be daunting, they should be funny, exciting and wonderful; and learning to be a reader gives a terrific advantage." ---- Roald Dahl. Want to test your child’s progress? Want their friends to get involved? You can do that by letting your kids and their friends participate in the GetLitt! reading challenge. 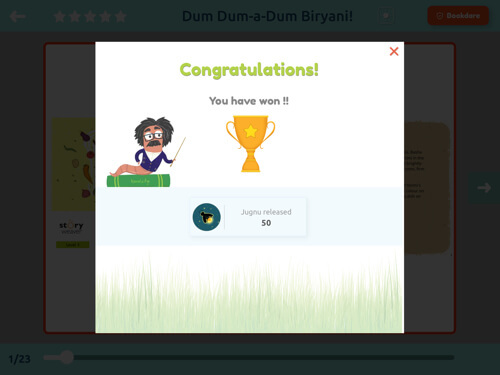 When a child starts reading on GetLitt!, they automatically become part of the ongoing reading challenge for the month. The moment you take a subscription on the platform, your child becomes part of the reading challenge for that period. 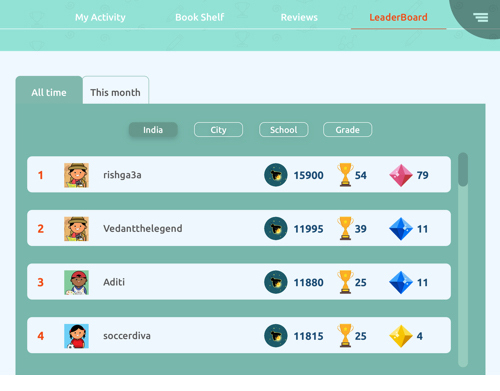 Don't forget to check the Leaderboard to track the young reader’s progress! You can also get your kid’s school to participate in the reading challenge. Teachers want children to inculcate the habit of reading. Our reading challenges can not only help the students interested in reading, but also make reading a fun experience that will make them eager to learn more. GetLitt! team can help schools organize special reading contests and related activities. The students can explore our collection and choose from a variety of offerings from different genres. 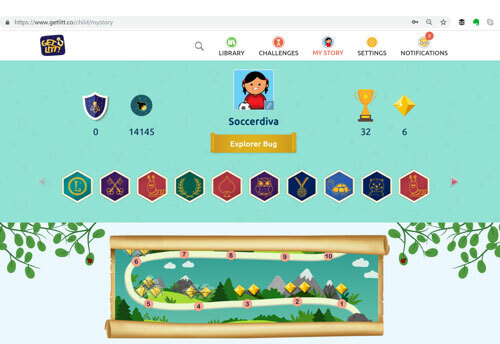 We can make the challenge more fun by also including various games and related contests, and the kids who perform the best can display their badges and achievements on their respective leaderboards. creating it’s offline version and will soon go live with it.